The darling, dense, tasty mushroom known as prugnolo dominates the culinary scene in central Italy from around the end of April through the month of May and into summer, depending on the weather. 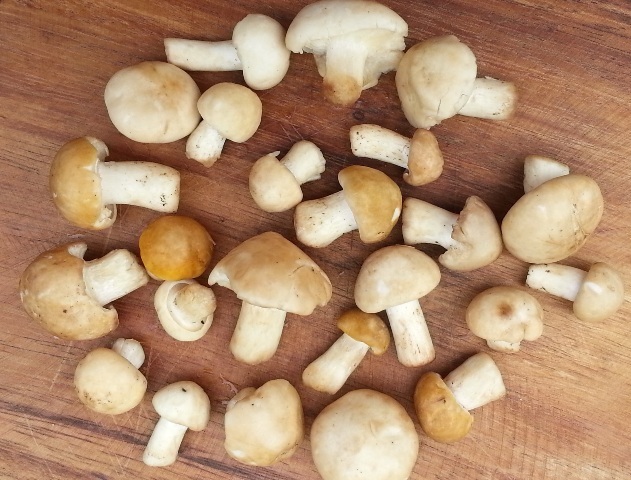 Also known as Saint George’s mushrooms (il fungo di San Giorgio) on account of their arrival close to George’s feast day (April 23) in some regions of Europe, prugnoli are the superstar of Tuscan sagre this time of year. In southern Italy, where prugnoli can start to appear in March, they are sometimes called fungo marzolino or marzuolo (marzo = March). Like any good mushroom, prugnoli don’t need much in the way of seasoning or elaborate prep. Keep it simple. If needed, rinse the mushrooms quickly, making sure they don’t absorb much water. If you have some larger prugnoli in your mix—they range in size from 3 to 10 centimeters—trim back the stem, which can be tough, and roughly chop the caps into pieces. Leave the smaller mushrooms intact. Cook them a few minutes in olive oil, then splash with white wine and continue cooking on low-medium heat. After about 10 minutes the prugnoli start to make a sauce. Cook for another 5 minutes from this point, maybe longer. These are tough-ish mushrooms and need to cook until softened. Test them. When cooked to your liking, salt lightly, taste, and correct for salt. Meanwhile, cook the pasta in salted boiling water until al dente. Transfer the cooked pasta to the pan of prugnoli and combine. Dust with quality Parmigiano (optional; a lot of folks would say skip the cheese) and garnish with a pinch of parsley.